Imagine yourself walking down the sidewalk of the city you live in, heading towards the store to buy some food for lunch, and in the distance, you hear music. As you turn around the corner of the block, you see a group of people, some dressed in all-white, some dressed in jeans and a t-shirt, and some with dhotis, kurtas or even sarees. They are carrying instruments and singing without repress. Each of them with tilak on their foreheads, clapping and rejoicing in the middle of a city normally painted grey with introverted strangers. 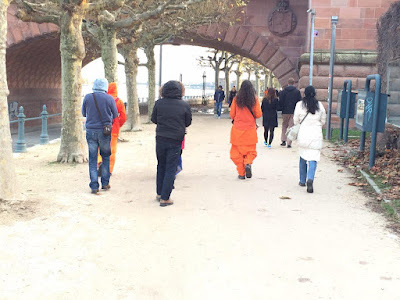 And somehow, the smile on their faces places one unto your own; you smile as you watch this group of bhaktas, slowly march down the street, singing, “Radhe! Radhe!” without a care in the world. The concept of Street Kirtan and the spreading of the Love of God through the chanting of Divine Names has existed for centuries. Bengal is the birthplace of Street Kirtan and was initiated by the glorious saint, Sri Chaitanya Mahaprabhu. In the years to come, the organisation called ISKCON (The International Society for Krishna Consciousness), would popularise this practice in the Western culture, particularly known to be in airports and at Union Square in New York City. If you have visited Shree Peetha Nilaya, then you have probably heard the mantra, “Bhaja Nitai Gauranga Radhe Shyam, Japa Hare Krishna, Hare Rama.” Every day at the center, this mantra is chanted in the temple continuously from 9:00 in the morning, till 9:00 at night, with community prayers in-between. But what does this mantra actually mean? The mantra itself can be broken down into several parts. First of all, we are offering service (Bhaja). What is the service? We are offering the qualities of Sri Nityananda (the companion of Chaitanya) and Sri Chaitanya Mahaprabhu, namely compassion and devotion, in the form of vibration for the sake of the world (Nitai-Gauranga). For what is this service rendered? The spreading of compassion and devotion will lead to the attainment of the goal of life, the lotus feet of Sri Radha Krishna (Radhe Shyam). Finally, how do we offer this service? This is all achieved through the repeated chanting of the Maha Mantra (Japa Hare Krishna Hare Rama). With the knowledge of what this mantra means, and from the inspiration of great saints like Chaitanya Mahaprabhu, Bhakti Marga has embraced the tradition of Street Kirtan wholeheartedly. Since December of last year, Street Kirtan has been performed every Sunday around the diverse cities of Germany. At the request of Sri Swami Vishwananda, Swami Vishwakanjalochanananda (formerly known as Chaturananda) has taken the lead on this project. Swami Kanjalochana has made an exceptional effort to make sure that Guruji’s wish for Street Kirtan to occur weekly has been upheld. Over the course of this last year, Swami Kanjalochana has had unexpected experiences that testify to the power of Street Kirtan. People who have never even heard about kirtan, become drawn to the Love that emanates from the Divine Names. The stories are innumerable, as each person that Street Kirtan has impacted are unique. 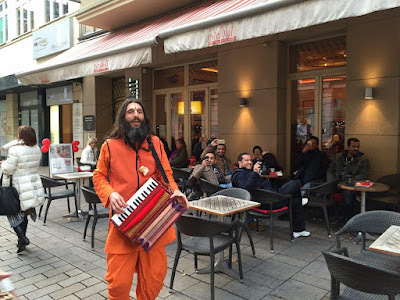 The practice of Street Kirtan has not only opened the minds and hearts of the sidewalk spectators, but it has also helped to shift the perspective of the participants. As it is natural to be shy, many people are hesitant at first to go out in public and sing in front of strangers. 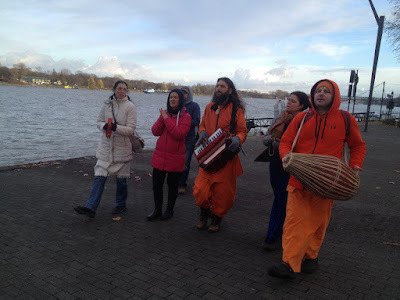 With a little bit of courage, and the support from people like Swami Kanjalochana, afterwards, they are so inspired that they often wish to start Street Kirtan groups in their own hometowns. Street Kirtan is a service that uplifts the surrounding environment through the vibration of the Divine Names. 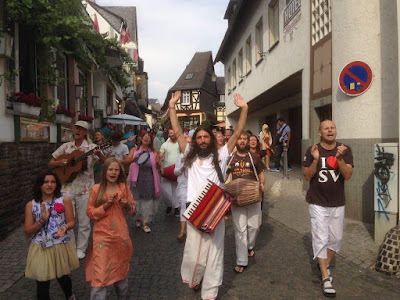 Though it has existed for hundreds of years, Street Kirtan is still a relatively new concept to the Western culture. The growth and future of Street Kirtan depends on the devotees who wish to serve humanity in a public way that instantly gives people a first-hand experience into the world of spirituality. 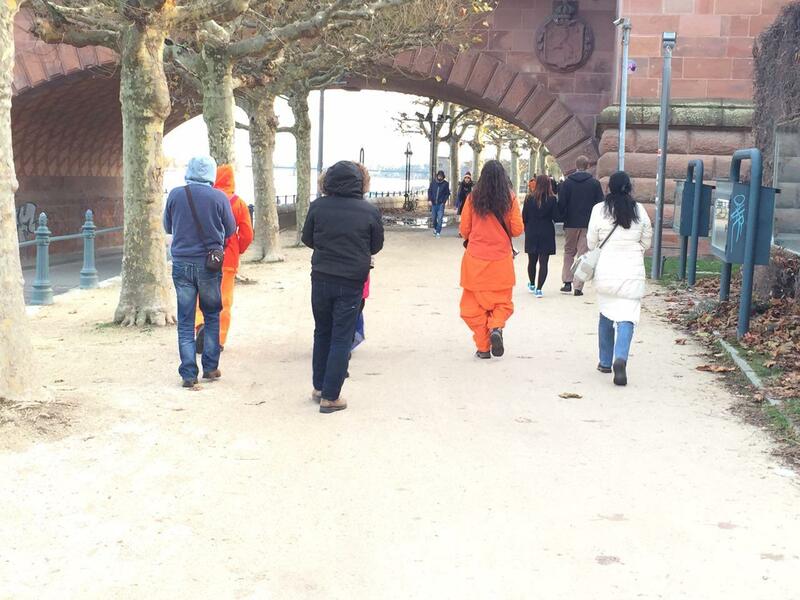 It is a method to open hearts and to acquaint people with Sri Swami Vishwananda and Bhakti Marga. 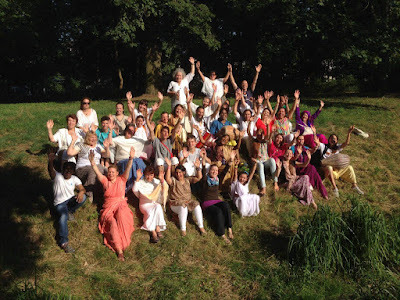 Swami Vishwakanjalochanananda is passionate about spreading Street Kirtan around the world and is willing to be of help to anyone who is looking to join an existing Street Kirtan group or to help anyone who aspires to pioneer a Street Kirtan group and make the journey to reach the heart of strangers on a Sunday afternoon. “Street Kirtan is a time when we can go and spread the Love of God first hand. Since I live in the ashram, my contact with the outside world is limited, and though this seclusion helps me to stay spiritually focused, it can also limit the opportunity to share the Divine Love that the world so desperately needs. It’s always fascinating to see the curious faces pass by as we sing bhajans. Often I have noticed how children have an intuitive nature for the Divine names, many times their faces light up with joy and they seem to be magnetised to the music. Street Kirtan also gives me a great sense of family. Just as a family supports each and other, every member participating adds strength to the rest of the group and we all have a great time singing the Divine Names.